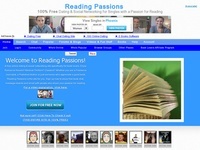 Reading Passions is a free dating site for singles who enjoy reading. Join for free and take advantage of free email, chat, forums to recommend some good books to others. As part of one of the largest dating networks online, Book Lovers Online Dating makes it easy for bookworms to meet online. Whether you are a poet, a writer, or just love to read, this site is worth a look. The Atlasphere�s mission is to bring together admirers of Ayn Rand�s novels, from around the globe, to network both personally and professionally. "LibraryThing is an online service to help people catalog their books easily. You can access your catalog from anywhere�even on your mobile phone. Because everyone catalogs together, LibraryThing also connects people with the same books, comes up with suggestions for what to read next, and so forth." "Goodreads is a place where you can see what your friends are reading and vice versa. You can create "bookshelves" to organize what you've read (or want to read). You can comment on each other's reviews. And on this journey with your friends you can explore new territory, gather information and expand your mind."